Grade 3 winner and multiple stakes sire Jess My Moon has returned to Keyser Creek Arena in Columbus, Montana for the 2019 breeding season. COLUMBUS, MT—JANUARY 23, 2019—Ralph Young's Jess My Moon SI 99, a multiple stakes siring half-brother to champions Moonin The Eagle and Moonist, has returned to Montana for the 2019 breeding season. The son of leading sire Mr Jess Perry will stand at Keyser Creek Arena, near Columbus, Montana, for a fee of $1,250, with consideration. A grade 3 winner of the New Mexico Derby Challenge, Jess My Moon won or placed in nine of 15 career starts and earned $78,450. He was also a finalist in the AQHA Derby Challenge Championship(G1), Texas Championship Challenge(G1), PCQHRA Breeders' Derby(G2), KOFX-FM Handicap(G3) and 6666 Ranch Handicap. From a minimum number of starters in six crops to reach racing age, Jess My Moon is the sire 57% winners, 11% stakes winners and 11% stakes-placed with average earnings per starter of more than $6,700. 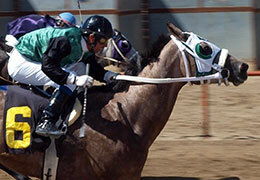 Jess My Moon's top performers are My Tuff Moon SI 104 (6 wins to 3, $26,302 Bucking Horse Sale Futurity, etc. ), Jessflipacoin SI 106 (5 wins to 4, $18,826 Jake Kapp Memorial S., etc. ), Mags Rambling Moon SI 113 (4 wins to 4, $16,452), Moonit Leader SI 85 (winner to 3, $13,394), Musical Jess SI 94 (2 wins to 3, $11,123 2nd Bucking Horse Sale Futurity), Jess My Apollo SI 104 (winner to 3, $9,340 3rd I-80 Futurity, etc. ), Jess My ove Si 102 (2 wins to 3, $9,220), etc. His sire Mr Jess Perry 113 ($687,174) is a 3-times champion and a "sire of sires". His get include 143 stakes winners, 9 champions, 896 winners with earning $54,674,613. Mr Jess Perry's top performers include Matabari SI 104 (champion, $1,410,471), Apollitical Jess SI 107 (World Champion, $1,399,831), One Famous Eagle SI 101 (champion, $1,387,453), Noconi SI 105 (champion 3 times, $1,356,459, All American Derby-G1, etc), etc. Jess My Moon is out of the two-time AQHA Racing champion filly Your First Moon SI 96 ($750,725), by First Down Dash. A winner of the Los Alamitos Million Futurity(G1), she is the dam of 11 ROM, 10 winners, 6 black type including four-time AQHA Racing champion Moonist SI 101 (24 wins, $878,468), AQHA Racing champion Moonin The Eagle SI 111 (7 wins, $548,985), Grade 3 winner Jess My Moon SI 99 (stakes winner see above), Grade 3 winner Stray Cat SI 93 ($58,538), All American Futurity(G1) runner-up The Marfa Lights SI 92 ($566,493) and stakes-placed Im Leonidas SI 93 ($23,963), etc. The second dam is the champion producing *Beduino (TB) mare Moon Arise, a half-sister to G3 winner Totally Done Gone SI 101 ($116,695). She is the dam of 15 winners, 17 ROM including El Primero Del Ano Derby(G1) winner Not A Full Moon SI 103 ($271,952), stakes winner and stakes producer Moonlight Corona SI 97 ($61,542), G1-placed Sunset Dash SI 102 ($250,795), etc. Last November Jess My Moon's half-brother Moonin The Eagle sold for a world-record stallion at auction price of $2.1 million. 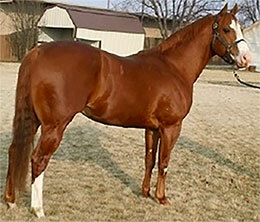 For additional information or breeding contracts to Jess My Moon contact Ralph Young at 406-425-1623.